Article contains an affiliate link. I don’t get the opportunity to travel nearly as much as I would like. I think this is true for most people. One of the things I enjoy most about travelling is the planning stage. I have been known to plan random trips that I’ll never actually go on. So now I’m going to share those trips with you. I decided to go with the cheapest flight I could get on Skyscanner from Dublin, leaving both location and dates open. For that, it selected a Ryanair flight to Birmingham. Which at the time was going for €20 round trip though I have seen it for half that price during a good sale. 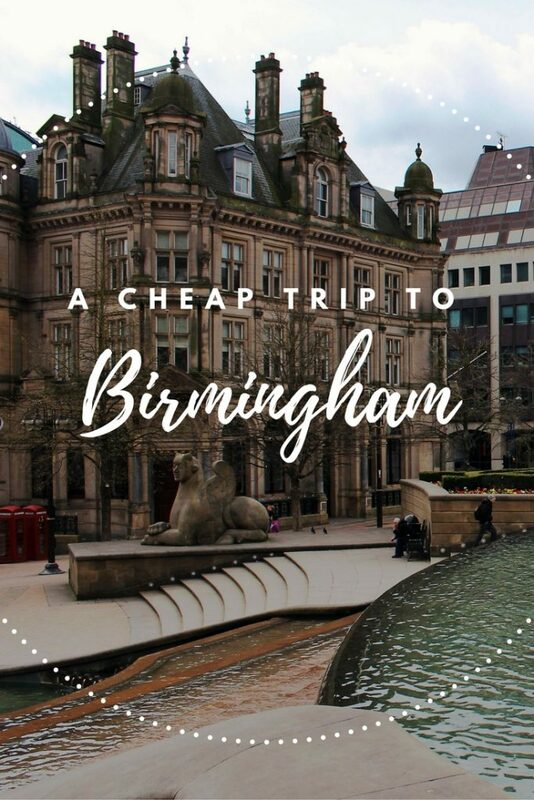 To get that price we (I always assume it’s my husband and I travelling) would be staying in Birmingham from February 17-21. It’s a bit of a lengthy stay for a cheap weekend away, but I’m sure there are a wide variety of things to do there. The flights are of course with Ryanair, which means either we get there incredibly early or incredibly late. I prefer to go with incredibly early, though my body regrets me saying that when I have to get up at 3 to go to the airport. One of my favourite places in #Birmingham, @ikongallery is a free space where exhibits are showcased. Today I got to view a Dan Flavin art show which comprises of fluorescent tube lights places in different parts of the room (on the walls). It’s very minimalistic and so rightly titled as “It is what it is and it ain’t nothing else”. I personally liked the monument series in his collection (no photography allowed so maybe you can go online and check). As for Ikon, it comes with the most awesome and cute bookshop that houses some wonderful knick-knacks… and there’s a coffee-shop too that serves great cake. For a budget, no frills trip we would be staying at the easyHotel Birmingham for a total cost of €211 for 4 nights. There may be cheaper places to stay thanks to sales but you really can’t go wrong with the easyHotel. It’s quite cheap and in a prime location for seeing the city. I’ve previously stayed in the one in Edinburgh. For lunch, I would grab the obligatory pasty that you have to get every time you go to England, or maybe that’s just me that does that. For dinner I would find somewhere near the canals, there are a number of different choices from around the world just in the small area around the National Sea Life Centre. It turns out that JRR Tolkien grew up in the Birmingham area, something I didn’t know until I started doing research for this trip. As a result, a lot of places in the local area served as inspiration for the Lord of the Rings, places you can still go to today. There are tours available if you want but I prefer to go at my own pace so I’ll be skipping that. Sarehole Mill Museum – Sarehole Mill and the surrounding area served as inspiration for the Shire. Be sure to contact the museum about opening times before you leave as I have seen several different things said online. Going through the mill is by tour only, but they do run tours quite regularly, they will cost you a small amount, currently £6 for adults and £3 for children 3-15. 264 Wake Green Road – This is the house where Tolkien lived while he lived in the Sarehole Mill area. It’s a beautiful looking home, but there’s not much else to say about it. Moseley Bog Nature Reserve – This nature reserve has hours of walking trails and was the inspiration for the Old Forest where Tom Bombadil lived. How much time you spend there is entirely up to you, it seems like the sort of place you could easily spend half a day in. Birmingham Oratory – This is an incredibly beautiful Roman style Catholic Church. Tolkien went to church here. The Tolkien connection aside this is a beautiful church and well worth the visit even if you aren’t a Lord of the Rings fan. They do mass in Latin on Sundays. Do research before you go, this is a working church and it seems that the only way to guarantee you’ll get in is to either be on a Tolkien tour or by attending mass. Perrott’s Folly and Edgbaston Waterworks Tower – Just around the corner from the Oratory and down the road a little bit are Perrott’s Folly and the Edgbaston Waterworks Tower. To get there walk around the back of the church on the road to where the Oratory’s parking lot is. Here you will first come across Perrott’s Folly, a beautiful gothic tower that was once part of a hunting lodge and if you continue down this road you’ll see the Edgbaston Waterworks Tower. These two buildings are said to have served as the inspiration for the Two Towers. Unfortunately, there isn’t much else to do except look at them from the street. There are a few other locations you can hit up if you really want to stalk Tolkien’s old stomping grounds, but they don’t really seem all that interesting to me. You can find them on a Tolkien Trail guide that the city of Birmingham has put together. One place that didn’t make my list for this day but is a must visit is the Birmingham Library which contains some of Tolkien’s original work. I’m not entirely sure where I would eat along the way, there seem to be a few different places trying to take advantage of the Tolkien link including the Hungry Hobbit Cafe near the mill and Tolkien Restuarant in the Plough and Harrow Hotel, where Tolkien and his wife is said to have stayed just before he went to war. To get back to the hotel from the Oratory jump on the 126 bus which is on that busy road that the Oratory is on. It’s a very short walk in either direction from the church to the closest bus stop. Buses currently come every 12 minutes and it will take you about 10 minutes to get back to the shopping district the hotel is in. It’s hard to believe it but we’re already at the halfway point on the trip! This day’s focus is a trip to Cadbury World! Begin the day by heading outside and going to the train station right in front of you, New Street Station. From here you’ll want to get on the train and go to Bournville, a 12-minute ride. From there you have a short, half mile walk to Cadbury World. Unfortunately, Cadbury World isn’t the place it once was. The production line, which was the highlight has been stopped for good. You still get to tour through the production line, but with it not actually making anything all the machines are at a standstill. Despite this it is said to still be a good time, so make sure you give yourself a couple of hours to enjoy it. After a few hours at the Cadbury World, there’s a Tudor-era home just a short walk away called the Selly Manor Museum. Admission to the house is £4 for adults and £2 for children. The wonderful news is that it IS wheelchair friendly! Give yourself at least an hour to wander through the historic home. By now it is almost certainly lunch time and I know I would be hungry after all that. An option is it eat in one of the places you passed on the way to Selly Manor, or if you head back towards the train station and keep going a little further you will find The British Oak, a grade II listed building that is an old pub from the 1920s. Your chance to grab some local food before you head back into the city for the rest of the day. With the rest of the day, I would most likely go check out the library and if there’s still time head out to the Botanical Gardens if I didn’t manage it the day before. This is also when I would make the ever so important trip to a Mexican restaurant. From my research, it looks like a taco truck called Habaneros might be the best Mexican in Birmingham, but as I’m looking for dinner, I would likely pick Bodega Bar & Cantina. Why? It’s very close to the shopping district the hotel is in, the photos of the food look pretty good. So far the whole trip has focused on the center of the city and south, today we’re changing that up a little bit by taking a trip to a church, a cemetery, mansions, and some beautiful gardens. We have two choices for the start of our trip today. Either we can get on a train at New Street station to the Jewellery Quarter, or we can walk and see St Paul’s Church along the way. If you want to take the train skip to the next section. If you’d like to go to St Paul’s Church head towards the Birmingham Cathedral following the map below. After the church continue following the map to the Victorian era cemetery. 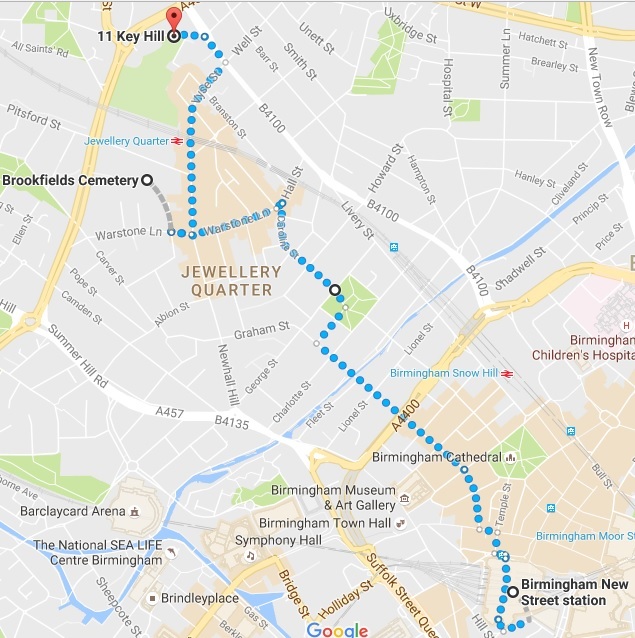 If you took the train you’ll wander your way through the Jewellery Quarter to the cemetery. It doesn’t have anyone famous buried in it, but it is an incredibly beautiful location. Cross the railroad tracks and you’ll find another cemetery, this one is called Key Hill and has some noteworthy people buried in it including Alfred Bird, the inventor of egg free custard and founder of Bird’s Custard. The next part of the trip is where not having a car gets a little bit difficult. The easiest solution would be to get yourself a taxi the two and a half miles to the next destination, Aston Hall. If you prefer not to get a taxi you’ll have to go back into the center of Birmingham to catch a train or a bus. Aston Hall is a ridiculously beautiful Jacobean era mansion that was built somewhere around the year 1618. Before you go make sure that they will be open, the hall is only available via guided tour on specific days with certain, very odd days off. The tour will last about an hour and twenty minutes and then you’ll be able to explore the park that surrounds the hall. Castle Bromwich Hall is the next stop, and in my mind completely optional. This is a hotel with architecture from the Jacobean era with formal English Gardens. The building itself is actually off limits unless you’re a guest in the hotel, but the gardens are open to the public. This will be another taxi ride as the bus to get there takes an hour versus the 20 minutes in the car. Getting back to the center of Birmingham from Bromwich Hall is quite easy, jump on the number 94 bus and get off when you’re back in the shopping district. This is your last day in Birmingham! Maybe you’ve got an early flight out, maybe you’ve got a late one. If it’s early you won’t have any time for playing tourist, it’s off to the airport for you. If you have the day to spend you could check out a few other destinations like Cannon Hill Park, Martineau Gardens, the Birmingham Rag Market, or if you really have time to kill check out the Dudley Zoo that has both a zoo and a castle, but is as you might expect not in Birmingham.